We’re excited to share with you the first of a few events within a series called “MIGHTY REAL The Politics of Queer Nightlife.” AB Soto, a visual/performance artist and musician, will be sharing and discussing his work on Thursday, September 17 in the Ransom Center’s Prothro Theater, from 1:30pm – 3:15pm. Born in East Los Angeles AB’s work as a visual / performance artist and musician is an amalgamation of his Latin roots and early influences; street and pop culture. This combined with a rebellious streak that challenges and questions mainstream gay culture and norms is what defines AB as a recording artist. AB’s early background as a professional dancer and fashion designer informs his work as the artist he is today – all of AB’s work is original and self produced; choreography, lyric, styling and design. AB’s art is a stylized commentary on homophobic attitudes present in the dominate culture. His aim is to show the diversity of the more marginalized members of the gay community and bring them to a wider audience. This artist/speaker series, open to the university and Austin communities, will invite musicians, entertainers, DJ, and organizers working in queer nightlife spaces to offer their perspectives on politics, performance, and labor. Prior to the infamous Stonewall Riots of 1969, bars, house parties, and nightclubs have been essential sites of community making and political action for gender and sexual dissidents. While these spaces are imagined as utopians and escapist, nightlife has long been the target of state surveillance and moral legislation. Additionally, recent scholarships have demonstrated how people of color, working class people, and gender non-conforming people are kept at the margins of entertainment cultures. It is imperative, in a climate of state-sanctioned racial surveillance, border patrols, and trans phobic attacks, to more critically politicize queer nightlife, an industry that is assumed to offer refuge from the psychic and physical violence of heteronormativity and racism. This series will offer perspectives from those working on the ground, and will provide a nuanced understanding of nightlife as a space of political action. 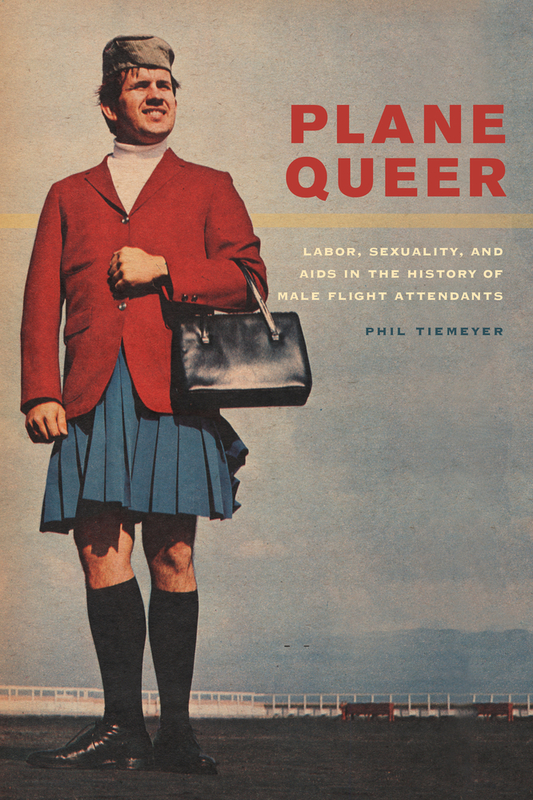 In 2013, Phil Tiemeyer, UT AMS alum and current Assistant Professor of History at Philadelphia University, released Plane Queer, a history of men working as flight attendants. We recently caught up with Tiemeyer to talk to him about his book, his teaching, and his time at UT. Can you tell us a little bit about your book, Plane Queer, and how you came to the project? My favorite coursework at UT was strewn over various departments: from Janet Davis’ course on social movements, to Ann Cvetkovich’s (English Dept) seminar on queer studies, to Mark Lawrence’s (History Dept) teaching on US Diplomatic History. So, naturally, I wanted to combine all these topics–especially gender, sexuality, and globalization–into one dissertation topic. This led me to think about viable topics that involved LGBTQ roles in the global economy. Between my own childhood passion for flying and Janet Davis’ love for her prior work as a flight attendant, I ultimately ended up focusing on airplanes—the mode of transport that most quickly binds the globe’s disparate nodes of economic activity. And it wasn’t long before I was reading about and conducting interviews with gay men who served as flight attendants, literally working in the aisles and galleys of these planes that are linking the world together. It seemed to me that these men could serve as an important lens for examining the ways that gender and sexuality are intertwined with work in today’s global economy. Plane Queer ended up being a well-received addition to LGBTQ history, as it is the first book-length chronicle of a gay-oriented career. Work so often gets overlooked as a locus of queer life, in favor of better-documented realms like LGBTQ activism or queer urban nightlife. Plane Queer didn’t end up being as global in focus as I originally envisioned–it focuses only on US-based flight attendants–but I was happy that it was able to chronicle queerness in this workplace all the way back to the 1930s, and all the way forward to the 2000s. 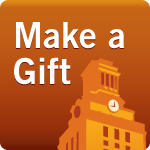 How is the work that you’re doing right now, as a scholar or a teacher or both, informed by the work that you did as a student in American Studies at UT? Almost every thing I do nowadays is a continuation of my time in American Studies at UT. I got hired in my current job because of my writing in LGBTQ history, and that’s the field I’ve been writing in since my early seminar papers at UT. I also teach a survey class now, so I’m really grateful that I read those hundreds of books for orals and sat in on Janet Davis’ and Shirley Thompson’s surveys and later TA’ed for Bob Abzug’s survey. 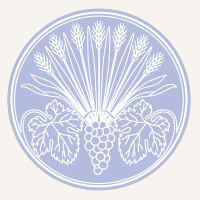 The more I work on my next book project, which is more focused on globalization and less focused on LGBTQ issues, I find myself grateful for the other work I did with Mark Lawrence and Richard Pells in the History Department–and equally grateful that our grueling preparation for orals forced me to master more than just one field. The only thing American Studies didn’t prepare me for were the other tasks that eat up so much of my time as a professor: committee meetings, advising, and other administrative tasks. Shielding us from these things, though, was surely a merciful act! There are so many components to landing a good teaching job that aren’t simply tied to writing good seminar papers and getting As in courses. All of these things matter just as much, if not more, even though they don’t appear on our transcripts: presenting at conferences, getting a couple of articles out while in grad school, and networking with scholars outside of UT who are doing similar work. It is also extremely advantageous to have introduced yourself and your book topic to acquisitions editors at university presses before graduating, since you’ll likely need to have your manuscript finished and under contract within 4-5 years after finishing at UT…and everything about the publication process moves really slowly. I know I could have done a better job with these tasks, and each would have helped raise my prospects on the job market and made my progression towards tenure much less hectic. But it was easier at times to stay complacent in the undergraduate student mindset: as long as I’m writing good papers and getting good grades, I’m fine. By presenting science as a central part of cultural history, I show students how scientific inquiry responds to cultural pressures. 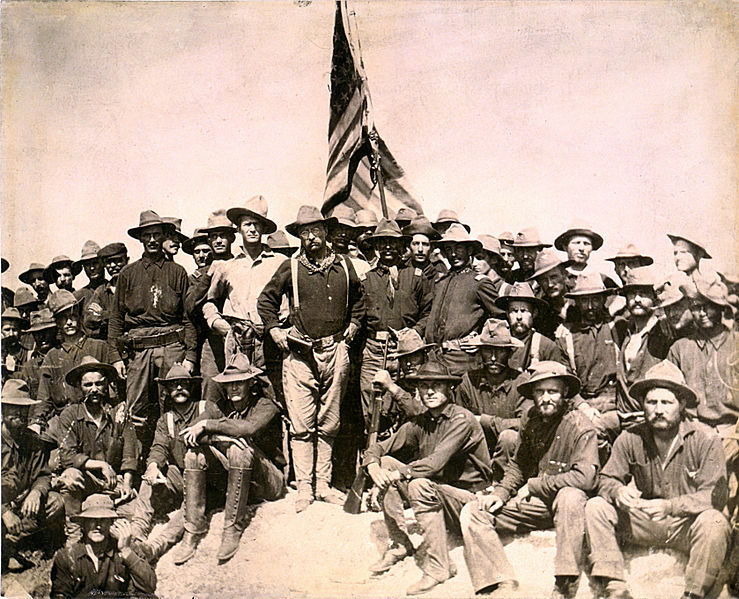 In the first unit of my “Cowboy Mystique in American Culture” seminar, I paired selections from Gail Bederman’s Manliness and Civilization about Theodore Roosevelt’s constructed sense of masculinity with “Agassiz,” a chapter from Louis Menand’s The Metaphysical Club detailing battles between various nineteenth century scientific race theories. To offer a concrete example of how race, gender, and science were entangled with politics, in class we analyzed Roosevelt’s use of the term “race suicide” in his own writings. By the end of the class, students understood that Roosevelt’s valorization of manly virility was deeply tied to emergent scientific anxieties about whiteness in the face of immigration and imperialism. Such transformative realizations eventually led the class to question the cultural pressures that shape current scientific debates, and to learn how to approach them from a historical, not polemical, position. In the Unit wrap-up, several students commented that they’d had to “break up” with TR (he’d been their favorite president!) after they’d learned to turn their critical eye towards his identity. The “Roosevelt as Bad Boyfriend” discussion was fun, for sure, but it resounded with students’ developing critical thinking skills. Music to my ears! 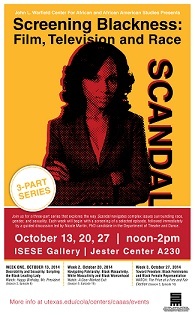 When Scandal premiered in April 2012, ABC became the first major network to feature a Black woman protagonist in a primetime drama in nearly forty years. The show follows Olivia Pope who, with her team of associates, manages the public relations crises of Washington D.C.’s elite while hiding her own illicit interracial affair with the President of the United States. Created by Shonda Rhimes (Grey’s Anatomy, Private Practice), Scandal is one of the highest rated dramas currently on television making Olivia Pope, arguably, one of the most influential figures for contemporary Black female representation. Week one of the series, “Desirability and Sexuality: Scripting the Black Leading Lady” focused on the construction of Olivia Pope as a black woman protagonist through the lens of sexuality. Discussion centered on the visual and embodied markers of Olivia Pope’s subject position vis-à-vis elements of costuming, character interaction and narrative structure. Attending to the scriptive moments of the show revealed the series’ strategic navigation of race, gender, and sexuality. In particular, audiences addressed the “double-reading” that occurs when observing Olivia Pope’s relationship with the President. This “doubleness” simultaneously activates a long history of sexual violence against black women’s bodies while also challenging the tropes of black womanhood that continue to dominate mainstream television. “Navigating Patriarchy: Black Masculinity, White Masculinity and Black Womanhood.” Watch: “A Door Marked Exit” (Season 3, Episode 10). This week will interrogate the assertion of power through character navigation of patriarchy. “Toward Freedom: Black Feminisms and Black Female Representation.” Watch: “The Price of a Free and Fair Election” (Season 3, Episode 18). This week will consider how to write and read for resistance in representations of black female subjectivity. The event is sponsored by the John L. Warfield Center For African and African American Studies. Hope to see you there!